Saturday, October 26th, 2013 - Categories: Competitions, Events. Join us for the 9th annual Blacklight Bouldering competition – also known as, one of the biggest and best climbing events in the region! 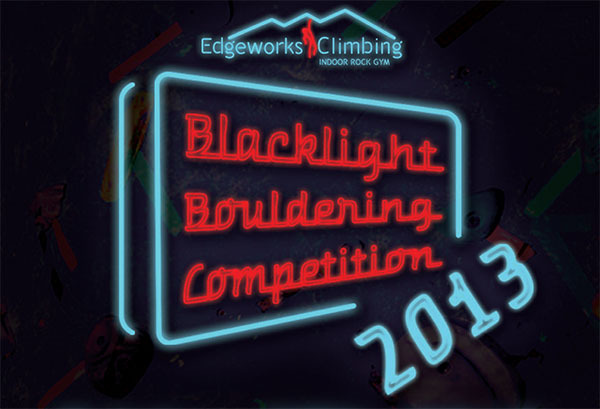 This unique event combines the fun of blacklights with the excitement and energy of a climbing competition. You can sign up for BOTH competing and volunteering on the website! 1) Sessions/Categories: Any category can register for either session (first come, first served). -1st Place in any other adult category will get a product prize. 3) USAC Credit and OPEN Category: Youth CANNOT get USAC credit for the comp if they compete in OPEN Category for prize money. In the unusual case that a youth participant wants to compete for BOTH USAC credit AND prize money, you must register for and climb in both sessions. Yes, that means they have to pay twice. Yes! We need you! Volunteer to be a competition judge (no experience necessary). $25 EW Gift Card, comp shirt and Karma points. $50 EW Gift Card, comp shirt, pizza and DOUBLE Karma points. We will need painting volunteers Thursday and Friday prior to the comp. If you are interested, please talk to Andy directly.